I can’t stop myself from raving about this Mushroom & Spinach Oats Khichadi. Recently, I have started on a slightly more controlled diet and introduced a lot more fibre in my otherwise sad state, extremely high carb diet. Replacing Rice and wheat with other grains and millets was the highest on my todo list.I can’t say I have been super successful cause it’s only been a couple of days but I am loving recreating magic with simple ingredients.After eating desi khichadi for two days, I was itching to try something new with it and this happened. Steelcut Oats are not only gluten free, they are also very high on fibre which means that eating them will keep you full for longer! The oats along with the Moong Dal makes it a much more balanced meal than something like a rice khichadi. 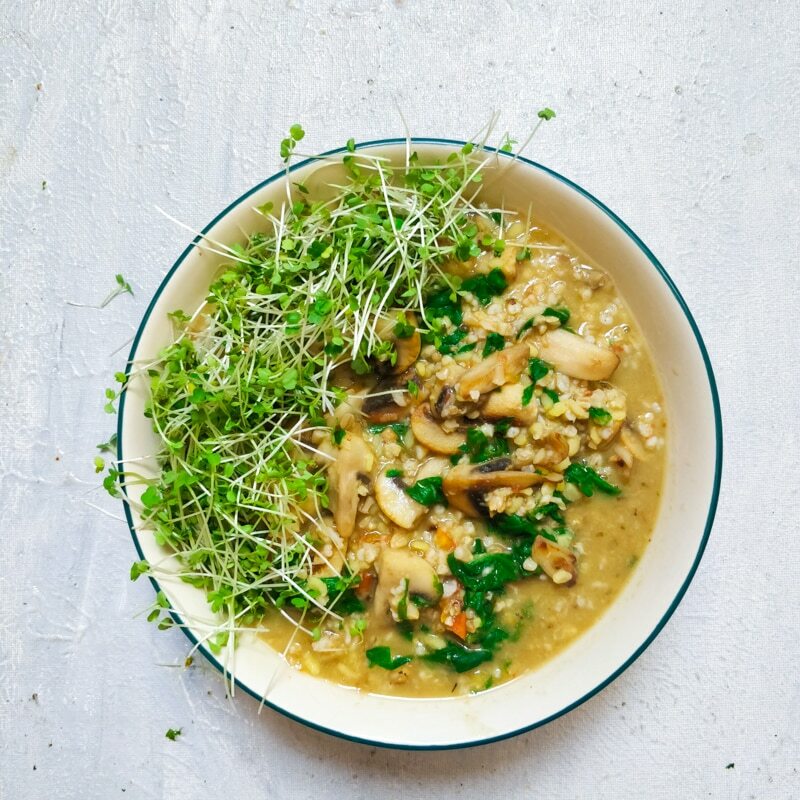 The Mushrooms and oregano off course glam up the the desi simple khichadi into a fancy .This simple change breaks the monotony and makes you so much more happy! Owning a pressure cooker for sure makes life easy.You dont have to keep track of the cooking because the loud whistles dont let you forget the pot on the stove.Though if you dont have one then you can either use in Instant Pot or use a normal sauce pan instead. To cook the Mushroom & Spinach Oats Khichadi in a normal pot, increase the water to 1.5 cups and cook it covered for 20-30 minutes till the dal is cooked and mushy. Mushroom & Spinach Oats Khichadi made with steel cut oats and Moong Dal.Vegan healthy gluten free recipe perfect for a weekday lunch! Add oil in a pan.Heat on High and add the garlic. To that, add the mushrooms and cook till they release their juices and brown a bit.This could take 10-12 minutes. Add the spinach and the dried oregano. Cook the Spinach till it wilts. Add the pressure cooked oats and Moong Dal and mix well. To brown the mushrooms- move them as little as possible.The more caramelised the mushrooms, the more flavour they will have. More such healthy recipes for you!